JCPA presents a five-minute video that dramatically and clearly delineates Israel’s critical security needs that can protect it from attack. The Jerusalem Center for Public Affairs presents a five-minute video that dramatically and clearly delineates Israel’s critical security needs to protect it from attack. In addition, the JCPA recently hosted a first-of-its-kind gathering of senior Israeli generals who outlined the basic principles of a defense policy focused on maintaining defensible borders for Israel. It was held in light of recent events, such as the deterioration in relations between Israel and its erstwhile ally Turkey, which underscore how critical it is for Israel to be guided by the principle of defending itself by itself. The video below, which features state-of-the-art graphics to depict Israel’s topography-related dangers, can also be seen on the JCPA website, as can a summary of the generals’ speeches. After the Six Day War in 1967, when Israel was nearly overrun by four Arab armies on three fronts, the United Nations resolved that every country in the region has the right “to live in peace within secure and recognized boundaries free from threats and acts of force.” The video shows vividly that if Israel does not control both the Jordan Rift Valley and critical mountains of Samaria, its borders would be rendered absolutely indefensible – and thereby in violation of the spirit of the UN resolution. 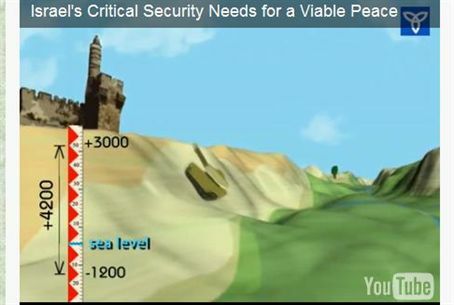 The video effectively utilizes 3D graphics to show, as no map can, how Israel is protected by the heights of the Jordan Valley on one side, and by those of the Samarian mountains on the other. “The Jordan Rift Valley on the east forms a natural barrier between Israel and the countries of Jordan, Iraq and Iran,” the narrator relates. It rises from 1,200 feet below sea level to a height of 3,000 feet above, “creating a steep virtual wall opposite any force attacking from the east.” Here, the film shows a Jerusalem-bound enemy tank failing in its attempt to scale and climb the steep mountainside. Similarly, the Mountain Ridge of Samaria is dramatically shown to dominate Israel’s Coastal Plain, Tel Aviv area, industry, population concentration, and airports. The film shows how Palestinian Authority control of the mountains of Judea and Samaria would mean that Jerusalem, Israel’s airports, and virtually every spot in the State of Israel would be within rocket range. “That’s why any future arrangement must include Israeli control over key areas of the mountain ridge and a demilitarized Palestinian state,” the narrator warns. Another point emphasized in the clip is the importance of Israeli control of the airspace over Judea and Samaria. To avoid the threat of fighter jets crossing into Israel – a four-minute fly from Jordan to the Mediterranean – Israel must be able to identify enemy planes before they cross the Jordan River, so that they can be shot down in time. This means, the video reiterates, that Israel must control the airspace over Judea and Samaria. “In his major policy speech at Bar-Ilan University in 2009, Prime Minister Netanyahu articulated a major shift in Israel’s policy – a restoration of Israel’s traditional security-based approach to achieving a lasting peace… In the aftermath of Arafat’s rejection of Prime Minister Ehud Barak’s peace offer, the Palestinian suicide bombing war that followed, Ariel Sharon’s withdrawal from the Gaza Strip, the Second Lebanon War, the failed Annapolis talks, and the recent war in Gaza, the Netanyahu government is re-adopting the notion that safeguarding Israel’s vital security requirements is the only path to a viable and durable peace with our Palestinian neighbors. “… Until now, the Palestinians have only been asked for a “top-down” peace process, in which their leaders have held meetings, shaken hands, attended peace conferences, and even signed agreements with Israeli leaders. But when a peace process does not sprout from the grassroots of a society, it is both pointless and useless. Until three-year-old children in Ramallah stop being taught to idolize “martyrs” who blow themselves up for jihad against Israelis and Jews, there will only be a “peace process” in the imaginations of the self-deluded." “It is commonly misunderstood just how vulnerable Israel actually is. Some 70 percent of its population and 80 percent of its industrial capacity are concentrated in the narrow coastal strip between the Mediterranean Sea and the West Bank. The adjacent West Bank hills topographically dominate the relatively flat and exposed coastal plain, providing a distinct advantage to an attacker… If the West Bank were to fall into hostile hands, the resulting situation would pose a constant threat to Israel’s national infrastructure, including Ben-Gurion International Airport, the Trans-Israel Highway toll road [Highway 6], Israel’s National Water Carrier, and its high-voltage electric power lines. By its presence along the eastern perimeter of the West Bank in the Jordan Valley and the Judean Desert, Israel has been able to prevent weapons smuggling and the infiltration of hostile forces… The entire Jordan Rift Valley constitutes a natural physical barrier against attack that averages between 3,000 to 4,600 feet. There are only five east-west passes through which an attacking army can move, each of which can be defended with relative ease. For this reason, the Jordan Valley has been viewed as the front line for Israel’s defense in an extremely uncertain Middle East. The advent of ballistic missiles and rockets has increased the importance of terrain and strategic depth for Israel, since its small standing army may have to fight for longer periods of time without reinforcements from the reserve forces, whose timely arrival may be delayed or prevented by rocket fire. Israel’s standing army may also have to operate for a considerable period of time without major assistance from the air force, which may be busy destroying the air defense systems of enemy states and suppressing ballistic missile launches aimed at Israeli cities." "The United States has historically backed Israel’s view that UN Security Council Resolution 242, adopted in the wake of the Six-Day War on November 22, 1967, does not require a full withdrawal to the 1949 armistice lines (also called the 1967 borders). There is no basis to the argument that the U.S. has traditionally demanded of Israel either a full withdrawal or a nearly full withdrawal from the territories it captured in the Six-Day War. "In the international legal community there was an acute awareness that Jordan had illegally invaded the West Bank in 1948 and held it until 1967, when Israel captured the territory in a war of self-defense. Israel’s entitlement to changes in the pre-1967 lines did not arise because it had been vulnerable, but rather because it had been the victim of aggression in 1967. "The Chairman of the U.S. Joint Chiefs of Staff (JCS), General Earl Wheeler, said on June 29, 1967: “From a strictly military point of view, Israel would require the retention of some captured Arab territory in order to provide militarily defensible borders.” Regarding the West Bank, the JCS specifically suggested “a boundary along the commanding terrain overlooking the Jordan River,” and considered taking this defense line up to the crest of the mountain ridge. Maj.-Gen. (res.) Aharon Ze’evi Farkash explained the importance of the demilitarization of a Palestinian entity, and Brig.-Gen. (res.) Udi Dekel elaborated on the need for Israel’s control of the airspace over Judea and Samaria. Maj.-Gen. (res.) Yaakov Amidror said that modern history in southern Lebanon, Bosnia, Egypt and Beirut has shown that peacekeeping forces cannot guarantee peace, and generally leave when one side attacks.